Before enrolling into a school, there are certain formalities that need to be covered. The important of these is registering the student. It is for this purpose that the school registration form is used. The parents of the student need to fill this form with all the relevant details like name of the student, age, date of birth and other relevant details. The school authorities may also expect the parents to submit certain documents with the form. You may also useful Event Registration Forms. 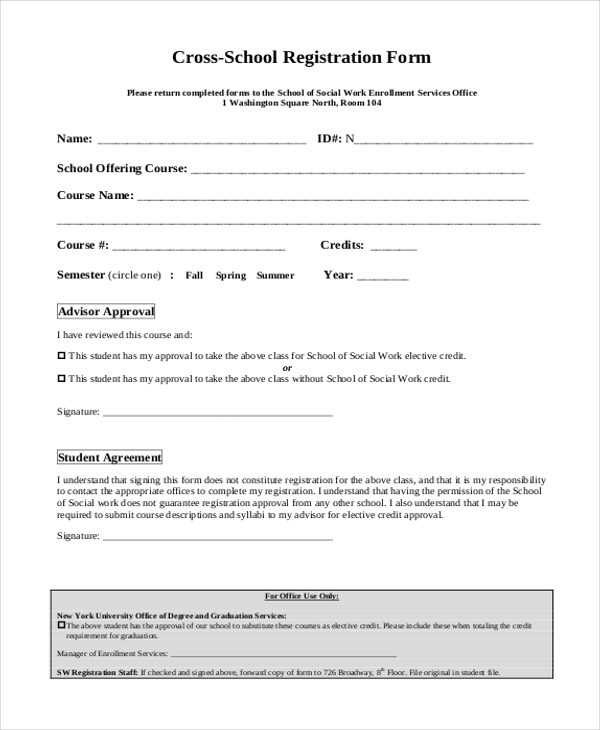 This form is used by the summer schools during the enrollment process to gain relevant information about the student wishing to register for a course. This form is used by the high schools to enroll students into their courses. The students are required to fill in this form with details of their previous school. 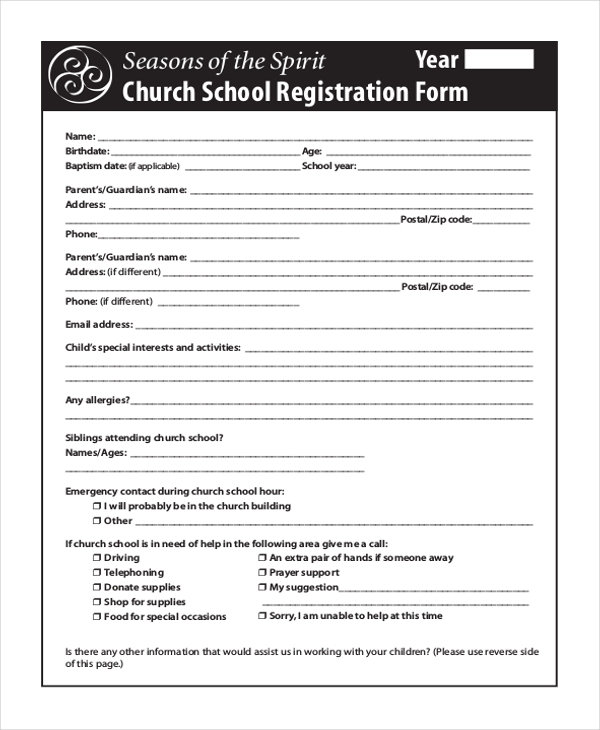 Any student willing to join a church school is required to fill in this form with relevant details which the authorities may record for later use. 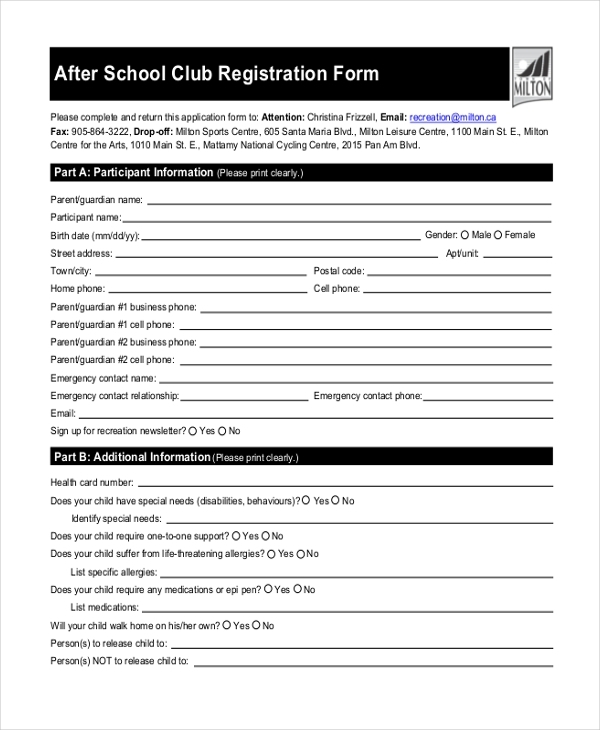 Any student who may be willing to enroll in a school club is required to fill in this form with detailed information. This form is used by school authorities to get a student registered into their courses. 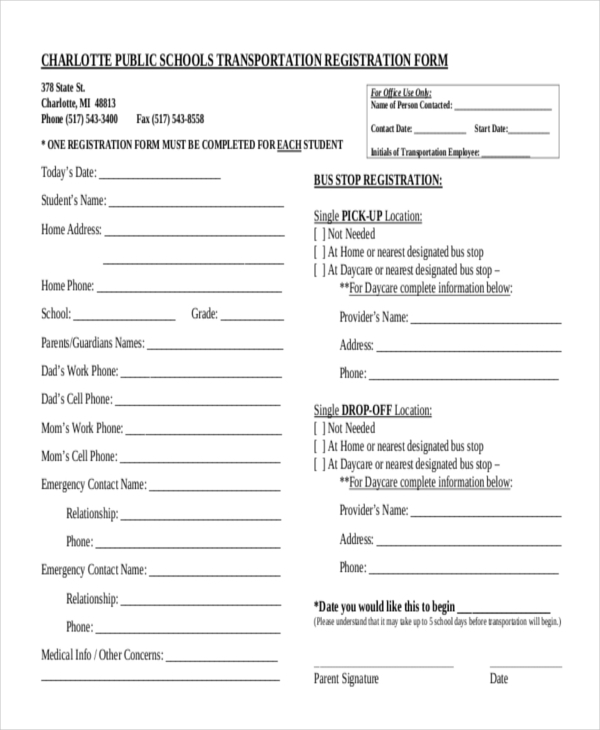 The parents of the student need to fill this form with their details as well as of the student. 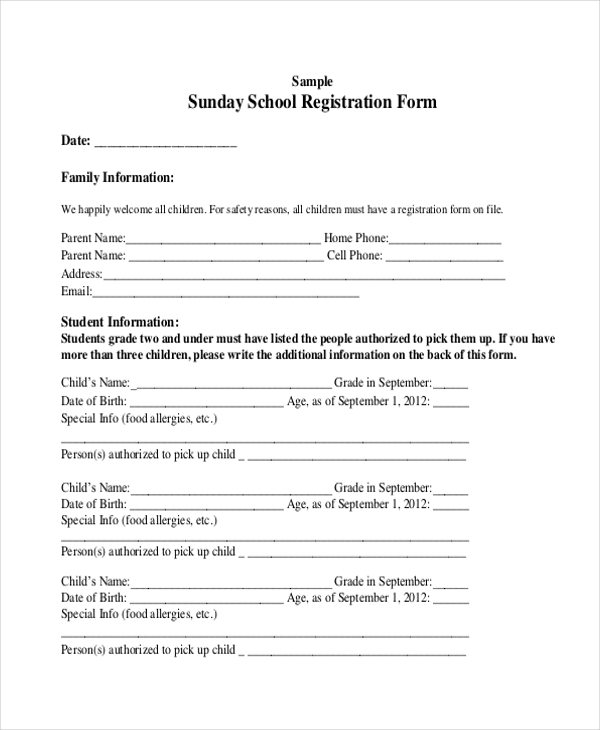 This is a sample format of how a Sunday school registration form should look. The school authorities can use this form just as it is or make changes to it. Any parent willing to enroll his/her child into a community school is required to fill this form with necessary details about the child. 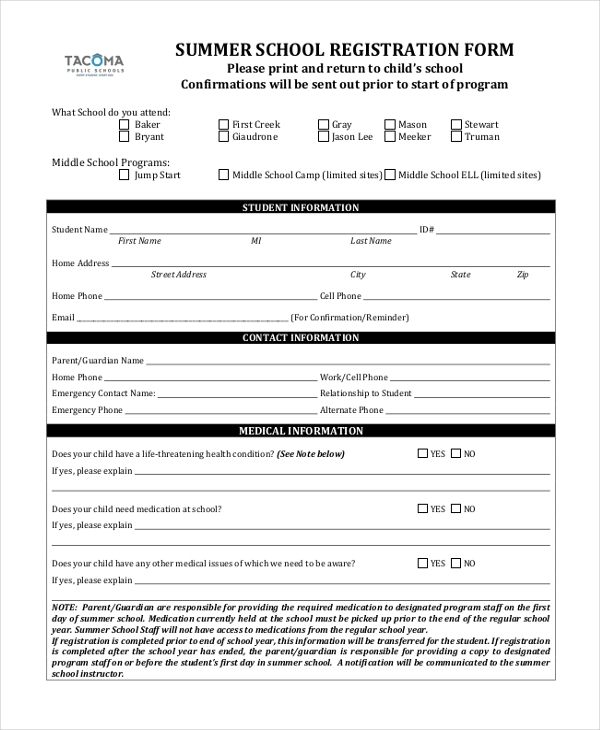 A student who wishes to take a course in another school needs to fill in this form and get it signed by his parent school to enroll in the course. Any student who prefers to avail the school transport is required to fill in this registration form with his personal details and address. 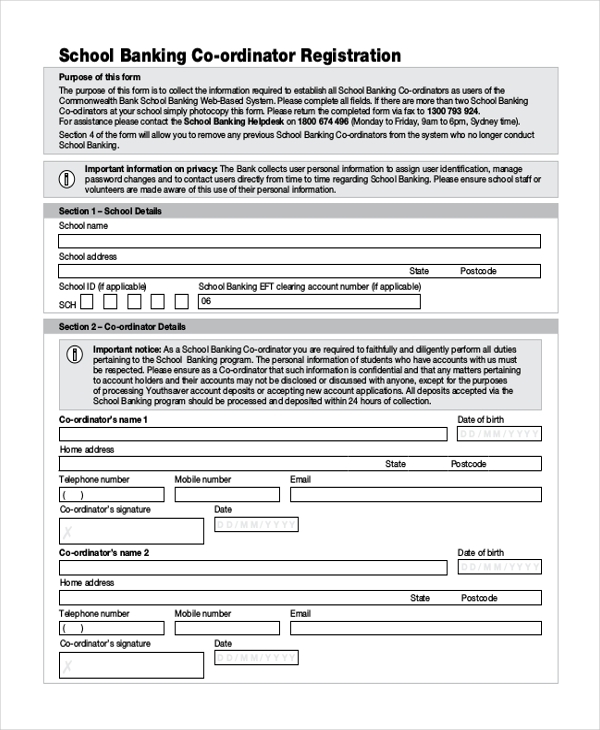 This form is used by a school to register one or more person to act as the coordinator between the school and the bank that holds the school finances. 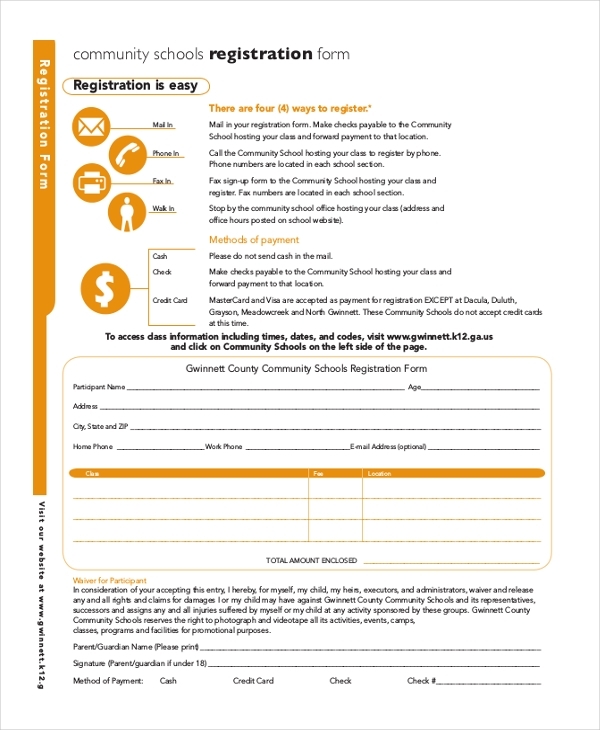 Why it is important to Use a School Registration Form? The registration process of a student in the school is quite cumbersome and the school requires crucial information from the student and his parents. Using a form with relevant segments makes it easier for the parents to fill in the details which may not be so if they were asked to do this on a plain sheet of paper. The uniformity of the form also makes it easier for the school authorities to process all the information and record them. Useful Payroll Register Forms. What are the Benefits of Using a School Registration Form? Using a school registration form has many benefits. The form acts as a proof in case the documents offered by the parents at the time of admission are a farce. How can you Design a School Registration Form? On the top of the form, place the school logo and name along with the details like address, contact information etc. Follow this with a segment where the name, age and other details of the student can be filled in. This should be followed by a segment where the details of the parents should be provided. Make sure to add a segment where you can list all the documents to be submitted with the form. You can also see NGO Registration Forms. 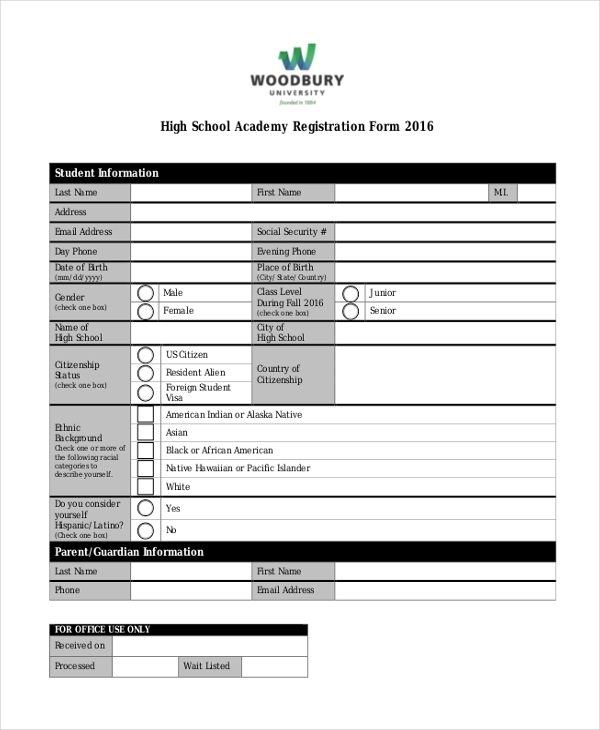 A school registration form needs to be structured and should contain segments that would help you get the maximum information about the students. Not sure how to design such a form? You can find a wide range of these forms on-line. Find the one that would be perfect for you and download it. Make necessary changes to personalize the form.